Ah, summer time. Great time to bring out the color in food. 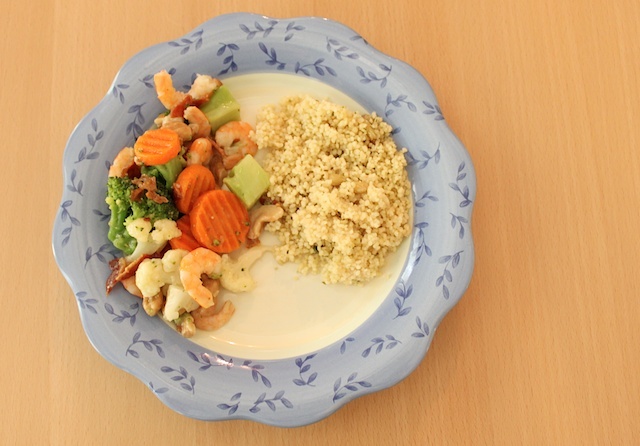 I made this simple meal with vegetable mix and shrimp served with a side of couscous. It’s a light meal that goes a long ways. 1. Cook the shrimp in a large pan or skillet with some olive oil until done. 2. Add the bacon and the vegetable mix. Stir occasionally and cook until the vegetables are not frozen anymore. 3. As the vegetables are cooking, you will make a quick butter sauce. In a small sauce pan, melt the butter on medium low heat. Add the basil and oregano and cook for 2-3 minutes. 4. Once the vegetable mix is done, pour the butter sauce over it and toss until well mixed. Then drizzle lime juice over the mixture and toss lightly. » Tell me… How do you like your vegetables? Raw or cooked?